A significant change in the forecast for Tuesday this week. A stronger weather system than we are used to seeing is moving through the region from the northwest. Winds are expected to become quite breezy, gusting up to 35mph. As the storm passes, heading south, the winds will change from southerly to northerly. Many trees in this area, especially in recent years, are not used to the northerly direction of strong winds. 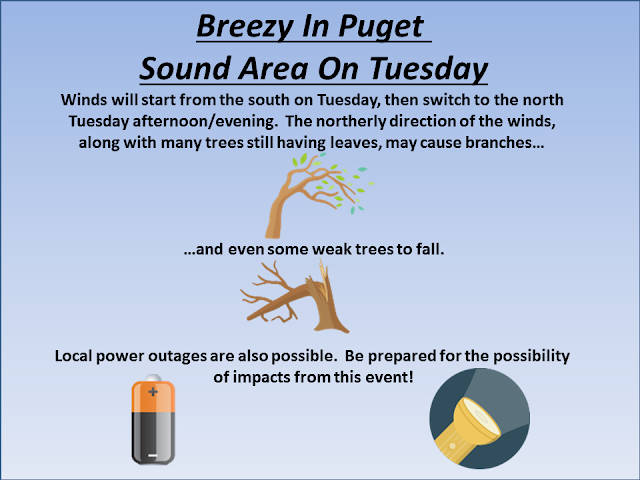 Also consider that most trees are still holding onto summer foliage, so the wind will put them under more stress than normal as the foliage will turn limbs into wind sails. Scattered local power outages are possible with this fall storm, as well as some downed tree limbs. Some weak trees could even fall over. The winds will not be strong enough to prompt a wind advisory or high wind warning. The remainder of the week remains to be the same forecast I wrote in last nights report.